Unprotected systems are an easy target for a malicious file-encryptor, Bkransomware Ransomware. This devious infection can encode data using the ROT23 cipher, and although it is decryptable, the victims of this infection can still face big problems. First and foremost, if this malware has invaded your operating system, you need to think about the lack of protection that it has. Clearly, security software does not exist, or it is outdated, and, in either case, that calls for trouble. You need to have your operating system protected at all times; otherwise, it will become vulnerable to any and every malicious infection, and we are sure you do not want that. First, of course, you need to figure out how to remove Bkransomware Ransomware. Once this malicious infection is gone, you need to take all security measures to ensure that malware cannot slither in and attack your personal files in the future. If you are here only because you want to delete the infection, scroll down to find the instructions you need. When Bkransomware Ransomware is executed on your computer, it immediately starts encoding personal data. Our research team has found that the threat can encode files in most drives, but it is limited to the types of files it corrupts. The infection encodes files with these extensions: .bmp, .c, .cpp, .doc, .docx, .jpg, .pdf, .png, .pptx, .py, .sql, and .txt. Besides encoding them, Bkransomware Ransomware also adds the “.hainhc” extension at the end of the original names, and that can help you identify the corrupted files easily. Do not try to rename the files because that cannot help you decrypt them. Although the infection does not set out to encode a great variety of files, it still can corrupt photos, documents, and other highly personal files, which is the goal for any file-encryptor, including Randomlocker Ransomware, Greystars Ransomware, or MC Ransomware. The creator of the infection knows that if you do not have your personal files backed up, you are most likely to want to recover them. Do you have backups? If you do, and you do not want to waste time figuring out how to decode the original files, you should just delete the malicious infection without further hesitation. After the files are encoded, Bkransomware Ransomware shows a message via the Command Prompt. The message reads: “send 50k viettel to 0963210438 to restore your data / Press any key to continue . . .” Are you familiar with Viettel? It is a Vietnamese mobile network operator, and one of its services allows purchasing vouchers to top up mobile credit. Although “viettel” is not really a kind of currency, it appears that 50,000 viettel would not be more than 4 USD. Since that is not a lot of money, some users might choose to pay it, but the thing is that there are no guarantees that personal files would be deciphered after that. The creator of Bkransomware Ransomware clearly has no regard for virtual privacy, and so you cannot really trust them to act decently. If you are going to take the risk, keep in mind that you might end up wasting money. The good news is that if you are tech-savvy, you can decode files yourself. Now, let’s discuss the removal of the infection. Needless to say, you need to delete Bkransomware Ransomware regardless of whether or not you manage to decode your personal files. Can you do it manually? That depends on whether or not you can identify a malicious process and file that belongs to this infection. If you can, you should have no trouble removing Bkransomware Ransomware yourself. And if you are not tech-savvy, and you do not have experience eliminating malware, installing anti-malware software is the way to go for you. Install this software now, and you will have the infection deleted in no time. What about other threats? These could exist, and so you need to be careful. If you employ an anti-malware program, all threats will be eliminated automatically. But if you decide to take care of everything yourself, make sure you scan your system and research the malware that exists. Find the ransomware process (the name is unknown) and right-click it. Select Open File Location to, hopefully, find the ransomware .exe file. In the Task Manager, select the process and click End task. In the location of the malicious file, right-click it and select Delete. Do not forget to install a trusted malware scanner to check for malware leftovers. 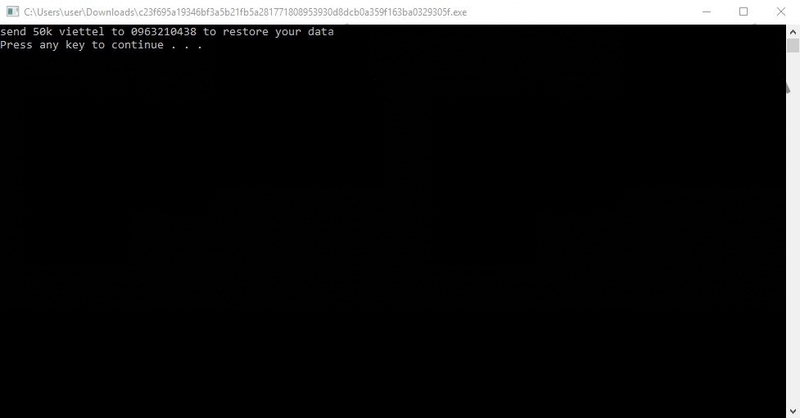 Quick & tested solution for Bkransomware Ransomware removal.